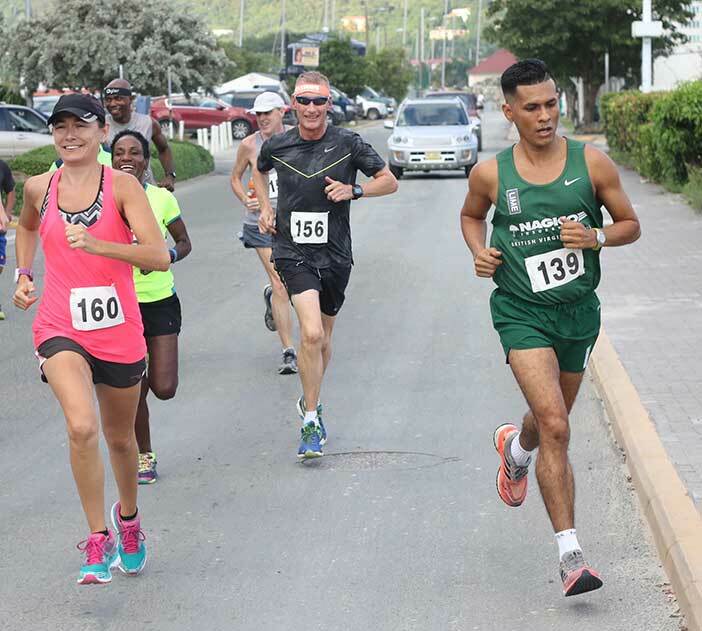 Some 16 brave souls took on Sunday’s Ring of Fire II, a 12-mile race that began on Cane Garden Bay Beach, took runners up Cane Garden Bay Hill, over the Ridge Road and down Windy Hill and back to Cane Garden Bay. At the turnaround, runners went in the opposite direction—going over Windy Hill and descending Cane Garden Bay Hill, covering more than 3,000 feet of elevation in the process. During the race, Reuben Stoby overcame Virgin Gorda’s Vincent Fournier and Maria Mays for the victory. He had a winning time of 1 hour 57 minutes and 05 seconds to Mays’ 1:57.23, times that were 10 minutes slower than St. John’s Timothy “TJ” Hindes time from last year. Stoby said he felt the race in his legs. The field also included 78-year old Bill Kinkead, who did the one lap course as he tunes of for the 2017 St. John 8 Tuff Miles. Final results: 1. Reuben Stoby, 1 hour 57 minutes and 05 seconds. 2. Maria Mays, 1:57.23. 3. Vincent Fournier, 2:01.17. 4. Guyp DuBois, 2:17.16. 5. Richard Morgan, 2:19.28. 6. Claudia Ferrari, 2:19.28. 7. Kay Reddy, 2:34.51. 8. Kerryann Dos Santos, 2:46.22. 9. Tia Beckman, 2:50.37. 10. David Mathews, 3:01.39. One Loop: 1. Adam Demonte, 1:02.01. 2. Shane Donovan, 1:04.44. 3. Russell Crumpler, 1:06.37. 4. Karen Fraser, 1:06.37. 5. Bill Kinkead, 1:25.02. 6. Michael Fay, 2:05.42.